Best Sub Ohm Tanks of 2019 - Don’t Buy Before Reading This List! No matter if you’re a beginner or an advanced expert, sub ohm tanks are a sure staple in any vapers collection. Because of their easy-to-use nature, sub ohm tanks are usually the first go-to tank for most beginner vapers, but more advanced vapers love them too for their great flavor and cloud production. But with so many different and varying sub ohm tanks out there, it can be hard to know if you’re getting a great tank, or just throwing your money and ejuice down the drain. So to save you the time and money, we’ve created a list of the best sub ohm tanks of 2019. We’ve chosen these sub ohm tanks based on their flavor, cloud production, airflow, and tank capacity. The FreeMax Mesh Pro is one of the best sub ohm tanks of 2019 for a number of reasons. Firstly, the Mesh Pro produces some of the best flavor possible thanks to its use of mesh coils. The increased surface area of the mesh means larger clouds, and enhanced flavor. Secondly, the Mesh Pro is compatible with coils from the original FireLuke and FireLuke Pro sub-ohm tanks. This means that not only do you get the coil options that are designed specifically for the Mesh Pro, but you also get the option of other coils as well. Included with the Mesh Pro are one 0.15ohm single mesh coil and one 0.2ohm double mesh coil but you also have the option of triple mesh coils as well. This means that your coil options are huge, and that you have the option of vaping at a variety of resistances and wattages. That said, the flavor is great no matter which coil you use. The Mesh Pro is top filled for easy refilling, with a red dot to indicate where to push. The Mesh Pro also has two large, adjustable airflow slots on the bottom of the tank and is able to be adjusted to whatever draw type you prefer. The tank capacity on the FreeMax Mesh Pro is a respectable 6ml and will last you long through your vaping day. All around, the Mesh Pro is an amazing sub ohm tank that delivers a wide variety of coil options and wattage capabilities with incredible flavor. With the ability to fire at over 110W with the triple mesh coil, you can get some pretty massive clouds. If you’re looking for options, the FreeMax Mesh Pro is the way to go. Sporting a sleek looking form factor with many color options available, the Uwell Crown 4 is a beauty. The iridescent, blue and purple colors are really quite unique and will add a touch of flair to your mod. But she’s not only a pretty face. The Crown 4 is the follow up to what has long and widely been considered the best sub ohm tank available, the Crown III. Now the Crown 4 looks ready to maintain that title. The Crown 4 comes with both a 0.4ohm coil and a 0.2ohm coil, but there are also 0.25ohm and 0.23ohm coils available. But no matter which coil you choose, the Uwell Crown 4 produces awesome flavor and the 0.25ohm coil will allow you to chuck some pretty respectable clouds. The Crown 4 features a convenient top-fill design where you simply: unscrew the top cap, stick the nozzle of your ejuice bottle into one of the two fill holes, and fill her up! Voila! This fill system is great, because you’ll never get leaking from the top cap. The airflow on the Crown is also amazing and has three wide slots that can be adjusted to suit your preference. With a tank capacity of 6ml you’ll be able to vape more and fill up less, and the flavor and cloud production are rated among the best you can get from a sub ohm tank. A great choice for any level of vaper. Hellvape are no strangers to producing great tanks, with the Dead Rabbit and the Drop Dead being just two examples. Now, Hellvape are catering to the masses of sub-ohm tank users with their new tank, the Hellbeast. This 24mm atty is backwards compatible with a bunch of different coil types and features dual purpose airflow slots that can be adjusted for either DTL or MTL vaping. With the Hellbeast you have the options of using a wide variety of coils. In addition to the 0.20ohm mesh coils that come with the Hellbeast, you can also use SMOK TFV8 Baby, Aspire Nautilus or Vaporesso GT coils as well! This makes the Hellbeast extremely versatile as it can be used at a wide range of resistances. The Hellbeast is super easy to fill. The top cap slides back with a firm push and clicks into place when fully locked for extra reassurance. The fill port is wide enough to accomodate bottle nozzles or droppers and is lined with silicone for leak resistance. There are two adjustable airflow slots on the Hellbeast which are located at the bottom of the tank. They are wide and fully adjustable and can even be adjusted for MTL use. By turning the airflow counter-clockwise, you reveal a series of 5 different sized holes. This also completely blocks off one of the airflow holes. The result is a customisable MTL airflow that functions marvelously. Keeping with the straight-lined aesthetics of the tank, the Hellbeast doesn’t come with a bubble glass. Instead, the straight glass will hold up to 4.0ml of ejuice. This isn’t as large as most other sub-ohm tanks, and means you’ll be refilling a bit more. However, the dense clouds and awesome coil compatibility of this tank far outweigh the inconvenience of refilling more often. 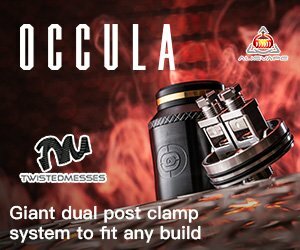 For flavor & clouds at low-mid watts, the Hellbeast is the best sub ohm tank you can get. Don’t take our word for it, grab one and see for yourself. Horizon Tech are known for producing some innovative tanks and coils, and the Falcon sub ohm tank is the latest edition to their impressive lineup. Just by taking one look at the color choices for the Falcon, you’ll be impressed by the unique hues and gorgeous resin drip tips. These coils are all amazing and the best one will vary according to your vaping style and preference, but included with the Falcon are an F1 and M1 coil to get you started. The Horizon Falcon features a top fill system that is very similar to the Uwell Crown III, where you unscrew the top cap and fill your desired ejuice. The airflow on the Falcon is also great and enters the tank through dual adjustable, wide-slot airflow holes. Whether you prefer a tight or an airy draw, the Falcon has got you covered. The tank capacity of the Falcon is 5ml which should be more than large enough for most of you vapers out there, and the flavor that you get off of this baby is insane. Definitely worth picking one up. It’s so good, it might even be worth it to grab two! With the huge success of the Crown line to live up to, the Valyrian is the latest sub-ohm tank from Uwell. Aiming to reclaim its position as the best sub-ohm tank, the Valyrian has been designed and outfitted with a few unique features to set it apart from the rest of the crowd, and provide a more flavorful vaping experience. One of these features is the ability to swap between three interchangeable “pins”. These pins are fitted into the interior base of the tank, and each pin will provide a different type of flavor and cloud production. This is a unique feature that hasn’t been seen before on other sub-ohm tanks, and will allow you to find a combination that is just right for you. Included with the Valyrian are two 0.15ohm A1 kanthal coils that are rated for 95-120W, and will provide amazing flavor and huge clouds no matter which interchangeable pin that you use. The coils on the Valyrian also wick extremely well, and can be pushed past 150W without any sign of a dry hit! Pretty incredible. For filling, the Valyrian uses a hinged top-fill system. By pressing a small button the side of the tank, the fill cap releases and reveals the fill holes. Three 8.5mm by 3mm adjustable airflow slots are located near the bottom of the tank, and when combined with the interchangeable pins you can get just the right setting that you want. The tank on the Uwell Valyrian is quite large at 5ml, which means that you can get a good while of vaping out of this beast before having to refill. The Valyrian is definitely a sub-ohm tank worth checking out. Maybe you’ve heard the hype about mesh coils, but if you haven’t, the FireLuke Mesh is a gorgeous introduction. With the utilization of mesh, the FireLuke Mesh coils will heat up more evenly and last longer when compared to regular coils. Not only that, but the mesh also means a more flavorful vapor and larger clouds. For vapers looking for the best mid-high wattage sub ohm tank, the FireLuke Mesh is the one. Included with the FireLuke Mesh are two 0.15 ohm kanthal mesh coils that are rated for 40-90W, but there are 0.12ohm coils in the works that should be available soon. The mesh coils means a more tasty, flavor intense vape that definitely ranks it among the best of the best sub ohm tanks. The FireLuke Mesh has an easy top fill system. Simply unscrew the top cap and fill your ejuice. As for airflow, the FireLuke Mesh is completely adjustable with two very large airflow holes located at the bottom of the tank. If you’re looking for an airy draw, the FireLuke Mesh can provide among the airiest. The only drawback to the great Mesh is the small tank capacity which holds 3ml of juice. Other than this minor drawback, the FireLuke Mesh is a very impressive tank that provides ample flavor at mid-high watts. The mesh coil is a great design and works wonderfully so if you’re looking to get more flavor out of your juice, the FireLuke Mesh is worth the buy. The SMOK TFV12 Prince is one of the most capable sub-ohm tanks ever released, and brings incredible clouds and flavor, as well as a dominant and beautiful tank design that is available in over a dozen different colors. Included with the TFV12 Prince are multiple coils, and you’ll get: one 0.12ohm decuple coil, one 0.15ohm sextuple coil, and one 0.40ohm quadruple coil. The variety of the included coils in not something that you see with many sub-ohm tanks, and the range of resistances will ensure that you get a coil that you like vaping with. The filling system on the TFV12 Prince is quite easy to use, and features a press to open, top-fill system with one large port. The airflow on the TFV12 Prince is also awesome, and consists of two super wide-slot, adjustable airflow holes. The tank capacity on the TFV12 Prince starts off at 5ml, but can be expanded up to 8ml by purchasing the larger “bubble” convex glass. Overall, the Prince is a great sub-ohm tank and sits comfortably on our list as one of the best sub-ohm tanks of 2019. You might be used to seeing your ejuice through the glass on a sub ohm tank, but not with the Aspire Cleito EXO. Instead, the EXO is designed with an impact resistant tank that is still quite attractive, and has a window on each side of the tank to allow you to see your juice level. Some will love it, other will hate it. Personally, we loved the design and found the rainbow/iridescent finish gorgeous, but there are a number of colors to choose from. The Cleito EXO has a variety of coil options available, but comes with a 0.16ohm coil and a 0.4ohm coil included. You can also purchase 0.2ohm coils separately. Each coil will function best at different wattages, which we’ve included in a table below. Keep in mind that while you can use the 0.16ohm coils, it reduces the tank capacity from 3.5ml to 2.0ml. Filling up the EXO is easy, you just unscrew the top cap and fill your juice. 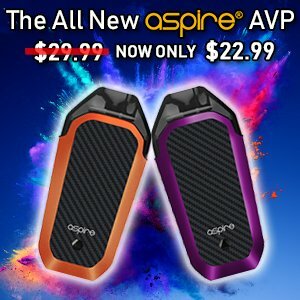 The only drawback to the Aspire Cleito EXO is that there is no adjustable airflow, but those who prefer a tighter draw will still love it. The draw is not very airy and is instead more restricted. While the EXO has a small tank capacity of 3.5ml and no adjustable airflow, the stellar performance, flavorful coils and beautiful impact resistant design are enough to earn the EXO a spot on our list of the best sub ohm tanks of 2019. Tank Capacity 3.5ml -- 2.0ml with 0.16ohm coil. A sub ohm tank is actually quite simple to understand. Simply put, a sub ohm tank is a tank that is meant to use premade, replaceable atomizers (coil +cotton) at less than 1.0 ohm. Sub ohm tanks are very user-friendly, and easily allow you to change the atomizers with factory-made ones that you can purchase from any reputable vape shop. In addition to their ease of use, sub ohm tanks are also very easy to take apart and clean, have large tanks that will hold tons of ejuice, and will provide great flavor and huge clouds. All of these benefits mean that a good sub ohm tank is: low hassle, great to take on the go, and most importantly — a great performer. Sub Ohm Tank or RDA? While sub ohm tanks are meant to be used with factory-made, prebuilt atomizers and come with a tank that allows you to fill it with ejuice and vape away, RDAs are quite a bit different. With an RDA, you have to build your own coils with your own wire and cotton, and there isn’t really a “tank” like sub ohm tanks. Instead, you’ll have to drip your juice into the RDA every so often in order to continue vaping without any dry hits. If you want to learn more about RDAs you can read our article here.